Scottish- born Charlotte Waldie (1788-1859), with her sister, Jane, and brother, John, travelled to Europe – as did so many others – in 1816/17, after the final defeat of Napoleon. For at least some of the time the two sisters travelled alone, when John was otherwise occupied. They each kept detailed notes of their journeys and sojourns: Charlotte turned her experience into Rome in the Nineteenth Century, first published privately and then, in 1820, by Archibald Constable. 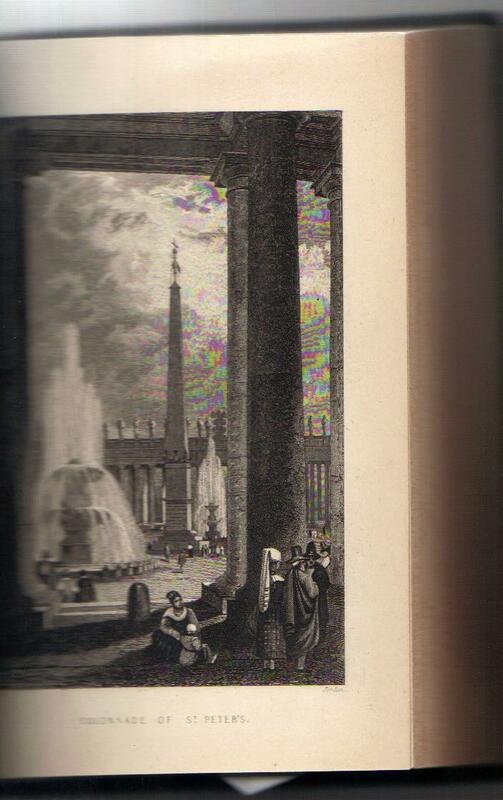 Charlotte’s view of St Peter’s, recorded in these extracts, was reflected through a prism of Protestantism. It is impossible to express my disappointment I felt on seeing what seemed to me to be – not a church, but a large house or palace, three stories high, with little attic windows at the top. The dome is placed so far back, in consequence of the length of the Latin cross, that in the front view its grandeur is lost. Its design is irredeemably faulty, in giving to the front of the greatest temple in the world the frittering littleness of the exterior of a dwelling-house, and the effect, in producing apparent mediocrity of size, is as striking to the eye, that I could scarcely recognise in it any character of a church, much less of St Peter’s, that boast of modern architecture, and latest wonder of the world. The crowded courts and irregular angles of that huge, unwieldy pile of building, the Vatican Palace, which adhere to it on one side like a monstrous excresence, are a great deformity. They overlook the top of the colonnade, depress the elevation, destroy its uniformity, and injure its general effect. Having ventured inside, Charlotte found ‘The interior, on the whole, as far surpassed my highly-raised expectations, as the exterior fell short of them. Yet notwithstanding its beauty, I was conscious of a species of disappointment too commonly felt, when what we have long dwelt on in fancy is seen in reality. I had pictured it to myself less beautiful, and far less magnificent but more sublime. With an imagination deeply impressed with the imposing effects of the Gothic cathedrals of our own country, I expected, from the immensity of St Peter’s, even more of that religious awe and deep solemn melancholy, which they never fail to inspire: and I was unprepared for its lightness, decoration, and brilliance; – and, above all, for that impression of gaiety, which the first sight of its interior produces. Charlotte condemns the use of Corinthian pilaster and, particularly, the Grecian arch which ‘has the unfortunate effect of diminishing the apparent length, which the the perspective of a Grecian colonnade, or a Gothic aisle, uniformly appears to increase….The windows, too, are mean and poor-looking, and offensive to the eye. It is easier, however, to point out the fault than the remedy; for windows do not enter gracefully into the beautiful combinations of Grecian architecture. In Gothic churches, on the contrary, how grand and majestic an object is the arched and shafted window! Indeed, if I may venture to own to you the truth, it is my humble opinion, that though Grecian architecture is admirably adapted to palaces and theatres, and places of public assembly, and public buildings of almost every other kind, it is not suited to churches….it does not accord with the solemn purposes of Christian worship, to which the simplicity and grandeur of the Gothic, and its impressive effect upon the mind, are so peculiarly fitted. Certainly some apology may be found for its defects in the frequent changes of plans, and architects, and Popes during the building of [St Peter’s]; and in the real and imaginary necessity of having an upper balcony for the purpose of giving the benediction; a circumstance which has been so ruinous to its beauty, that we might say with truth, that the blessings of the Popes have been the perdition of the Church. But whatever the cause, the faults of the front of St Peter’s are unredeemable and unpardonable. This entry was posted on March 12, 2013, 11:22 am and is filed under Women Writers and Italy. You can follow any responses to this entry through RSS 2.0. You can leave a response, or trackback from your own site.